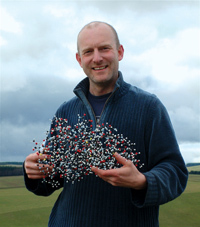 Molecular Models: Tangible Representations of the Abstract by Gavin Whittaker, Ph.D., Miramodus Ltd.
Gavin Whittaker (gavin@miramodus.com) is the managing director of Miramodus Ltd., based in Edinburgh, Scotland. He holds graduate and postgraduate degrees from the University of Oxford, and worked as a lecturer in physical chemistry at the University of Edinburgh for several years. He maintains academic and business interests in his research area of microwave-induced chemistry. Miramodus itself, formerly known as Beevers Miniature Models, was formed as a ‘spin-out’ company from the University in 2007. More information about the business and its models can be found at www.miramodus.com. An email drops into my inbox from somewhere in the world, from someone that I will probably never meet, asking whether we could produce a model of a protein. I log into a protein structure database and check out the size and shape of this molecule. Over the next few days, mail flies back and forth between us, in which time we determine whether he wants to show every atom, or just the backbone carbons; whether they want prosthetic groups or ligands included in the model; and what colors they would like. The design remit is set and a few weeks later, the custom-made model is shipped off to a (hopefully) delighted customer. Ours is just one possible model type that can be used to represent that protein, but in this case, our ball and spoke model illustrates the protein function in a way that the customer wants for when he has to explain his research to visitors. The Oxford English Dictionary defines a model as a representation in three dimensions of some projected or existing structure, or of some material object, artificial or natural, showing the proportions and arrangement of its component parts. We are familiar with models in our everyday lives, perhaps so much so that we lose sight of what it is that we are seeing. Most people encounter, or even build, models of mechanical structures, buildings, or different forms of transport. Such models are often scaled down versions of larger structures, and in many respects they are very similar to the objects that they represent, being scaled down by factors of only 10 to 1000 times. Molecular models are very different from these engineering models. For a start, we are scaling up, typically by a factor of 1010. Furthermore–and this is something that we seldom consider–we are attempting to produce models of structures that are already models, albeit mathematical ones. Those mathematical models themselves are forced to make assumptions and approximations, such as the hydrogen-like nature of orbitals in larger atoms. At best, we are talking about creating models of a model of an approximation; illustrations of descriptions of reality. 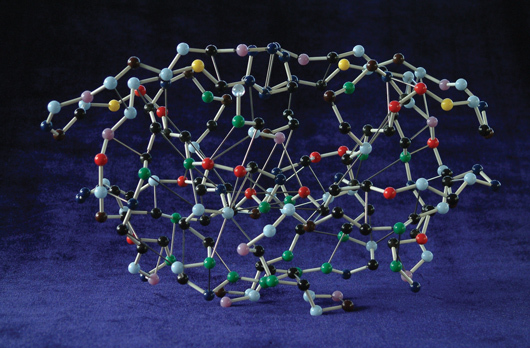 Unlike engineering models, molecular models can never be perfect replicas of molecular structures. The difference between the quantum world and the macroscopic world is, in that sense, an unbridgeable gap. When we decide to construct a model of molecular structures, therefore, the first thing that we must do is to decide what the purpose of the model is. If a molecular model cannot be in any way a replica, then the purpose of the model must be the representation of a particular aspect of the molecule. Different types of molecular models illustrate different aspects of the molecules that they represent, but there are two fundamental things that they show: either the position of the nuclei, or the volume occupied by the electrons. The former, typified by ball and rod structures, allows us to visualise the relative positions of the atoms and whether or not there are bonds between them. The latter, almost always space-filling models, allows us to see the volume occupied by the molecules. More often than not, we begin our education in molecular structures at school by drawing structures that comprise element symbols linked by lines or grouped in units such as -CH3. The great advantage of space filling models at this stage of a science student’s education is that they show how the simple 'structures’ written on paper are actually representations of electrons held in check within volumes whose shapes are defined by the properties of the nuclei. As we become more familiar with the nature of chemical bonds and electron orbitals, the size and shape of the electron clouds (and hence the shapes of the molecules) become implicit to us in the structures that we write. Indeed, most of the time, it is doubtful that many of us even give a second thought to this process. For the majority of the time, it is therefore sufficient for us to represent the positions of the nuclei–we automatically ‘fill in’ the volume of the electrons clouds for ourselves. This is akin to a veterinarian seeing a skeleton of an animal and visualising the living creature and the way that it moves. This is obviously tremendously useful–the fact that we can, to some extent, extrapolate the electron clouds of a molecule from the position of the nuclei, almost without thinking, allows us to get more from ‘skeletal’ structure models than might otherwise be the case. This ability allows us to use the most common form, ‘ball and spoke’ models, meaningfully in our teaching. Function in chemistry has as much to do with shape and form as anything else, and the fact that it is possible to see right through a ball and rod structure to view atoms on the far side of the model opens up the model’s teaching potential enormously. It allows the viewer to clearly see the range of atoms that make up the structure (the constitution) and the manner in which the atoms are joined together (the configuration) to form the shapes that those linkages produce (the conformation). Were we to represent the same structure with space-filling units, it would hardly be possible for us to see beyond the outermost layer of atoms. That we can see through and into the structure allows enormous amounts of information to be conveyed in a simple and elegant form. A model of Proteinase-C, built to show the positions of the a-carbons. This is where we come in. Our particular business is to make those models for people: businesses, museums, academics, individuals--even lawyers. This is the business that Arnold Beevers started as a unit within the University of Edinburgh, some 30 years ago. Following Arnold’s retirement, Sheila Gould took over the running of the business for several years. Eventually, Sheila’s retirement and that of most of the staff, combined with a shift away from universities running businesses, meant that someone had to take over 'Beevers Models’ or it would have simply ceased to exist. This would have been a tragedy--Beevers models grace museums and academic units around the world. In the words of the late Victor Kiam, former owner of Remington; "I liked [the product] so much, I bought the company," and have been running it ever since. We took on new staff, and although we still work in the University of Edinburgh’s School of Chemistry, where I lectured for several years, we are now completely separate from it in administrative terms. Most of our business centers around building ball and spoke models of inorganic structures and small organic molecules. Whilst not always trivial to design, there is little debate over whether to include all the atoms in these structures--it is precisely the relations between all of the atoms that people want to see. When we build models of proteins, though, things are a bit more complicated. The number of atoms in an average protein would make the costs astronomical in many cases. However, most representations of proteins are approximations--just as we learn to imply the presence of electrons around an atom in an inorganic structure, we learn to "see" the structure that accompanies such symbols as 'gly’, 'asp’, etc. When we build protein models, therefore, we often make the same simplification. Taking the alpha carbon as our residue 'centre,’ we represent each one with a different coloured ball. By using a scale of 1cm=2Å, we produce models that are small enough to handle, but large enough to show the structure and, where necessary, such things as haem groups or iron-sulphur clusters. We are very aware that the models of proteins that we build, like all protein models, are not a "likeness" of the protein, but they are a representation of its structure that the owner can use to see relative distances and forms that cannot be as easily seen on a computer screen. We are often asked how long we think that the business will last in a world of ever more realistic computer graphics. The fact is that our 3D vision is a far richer phenomenon that the result of two slightly dissimilar images. Depth of field and the ability to refocus in an instant all add to our experience. As a consequence, the three dimensional nature of physical models is much more easily "seen" than even the best computer graphics. Maybe the greatest irony of all, though, is the number of model sales to theoreticians who can’t easily visualise or demonstrate the interactions in the molecules that they are studying. Ultimately, many people simply take pleasure from owning the tangible and elegant object that represents their research interests. So long as people want to have their prized molecules, crystal structures and proteins on display, rather that appearing as a virtual entity on a screen, and as long as people need to have a physical representation of reality to hold, we’ll still be here to make the models for them.